Francisco Saldana developed a tight routine when he worked as a Harvard University Dining Services chef. Six days a week, he would enter the Leverett House dining hall at 1 p.m. After preparing food until the late evening, he would get into his car and drive as fast as he could back to Reading, Mass. He usually got to his apartment, which he shared with an older bake chef from the Copley Plaza Hotel, around 10 p.m.—just in time to put in a few hours in his bedroom’s makeshift recording studio before waking up the next morning to head back to Cambridge. Four years later, to say that Saldana’s hard work has paid off is an understatement of the highest order. The stomping, swaying sound he began to perfect in his bedroom with part-time Leverett House dishwasher Victor Cabrera has made them both into global stars—by far the biggest musical success stories to emerge from Harvard in recent years, dwarfing the profiles of student artists. Saldana, now 26, is known to fans as Luny; Cabrera, 24, is called Tunes. Together, they are Luny Tunes, a producing duo with a Midas touch. Their laser-sharp electronic beats have fueled the explosive rise of the hybrid pop genre known as reggaeton. Working from their base in San Juan, Luny Tunes have been responsible for a huge share of the hits that have propelled reggaeton from the barrios of Puerto Rico to the major urban markets of the continental U.S.
Before Luny Tunes, reggaeton artists laced gritty Spanish-language raps over rough beats sampled from Jamaican dancehall reggae—a far cry from the pop pulse that fills clubs today. Saldana and Cabrera changed the genre forever, with reggaeton’s most popular artists rushing to associate themselves with the sleek, radio-friendly Luny Tunes brand. Their futuristic sounds have powered Tego Calderon’s “Al Natural,” Wisin and Yandel’s “Rakata,” Don Omar’s “Entre Tu Y Yo,” Zion and Lennox’s “Hay Algo En Ti,” and countless other anthems. Most notably, they produced Daddy Yankee’s smash single “Gasolina,” which brought reggaeton to MTV in 2004. American listeners who couldn’t quite catch Yankee’s rapid-fire Spanish lyrics were mesmerized by Luny Tunes’ weightlessly hammering synthesizer beat. Today, when Harvard students hear reggaeton’s distinctive Latin-Caribbean BOOM-ch-boom-chk echoing from a car radio or the speakers of Currier TLR, there’s a good chance they’re nodding their heads to the work of two superproducers who used to work just across campus in McKinlock Hall. Luny and Tunes were living near Boston, in the cities of Peabody and Lynn, when a mutual friend introduced them in the late 1990s. Both were still in their teens, just a few years older than when their mothers had brought them to the United States from their birthplaces in the Dominican Republic. It was a lucky meeting. Luny was a self-taught drum-machine prodigy; Tunes was a skilled keyboard player, working on hip-hop-influenced instrumentals in a small studio he’d set up in a closet at his family’s home. Soon the friends were talking about combining their skills and the far-off, thrilling prospect of stardom. A few years later, Luny’s mother left Peabody and moved to Puerto Rico—where, it just so happened, an underground reggaeton scene was in full swing. For Luny, equally family-oriented and ambitious, a game plan began to come into focus. “I stayed, making some money to buy a recording studio and [move] to Puerto Rico,” Luny says. For the time being, he and Tunes settled into a series of service-industry jobs. In the summer of 2000, Luny was earning $8 an hour as a chef at Salem Country Club, a world-class 18-hole course where Massachusetts’ well-to-do golfers have toted their clubs since 1925. One of his fellow cooks at the clubhouse was Raphael Brathwaite, who worked as a chef in Leverett House during the academic year. When Brathwaite offered to introduce Luny to his employers at Harvard, he jumped at the possible pay raise. Luny started as an assistant chef at Leverett in October 2000, quickly fitting in with the dining hall workers’ friendly community. To his co-workers, Saldana was “Frankie”: an easy-going charmer with a palpable drive to succeed. Meanwhile, the more soft-spoken Tunes was getting frustrated with his minimum-wage job at a local Dunkin Donuts. When he quit, Luny recommended his friend to his boss at Harvard. In September 2001, Tunes started work as a dishwasher in Leverett. “My memory of Victor was just very polite, a little quiet,” Johannessen says of Tunes. She recalls “vaguely hearing some things” about her employees’ non-culinary talents. But when Luny mentioned his and Tunes’ growing plans for musical success, his old colleague Brathwaite chalked it up to idle boasting. As far as Johannessen knew, their jobs at Leverett didn’t leave much room for music. There wasn’t—but every day off, every free hour, Luny and Tunes were inching toward their dreams with more and more complex beats. Whenever they could, they worked late into the night on the mixer, computer, and speakers in Luny’s bedroom, trying not to bother neighbors too much with the noise. A phone call in the fall of 2001 gave Luny Tunes the break they had been waiting for. Some of their beats had gotten into the hands of powerful figures in Puerto Rican reggaeton. DJ Nelson, one of the island’s most prominent producers, was impressed enough to invite them to make music full-time. Tunes wasn’t immediately sold on the idea. That spring, activists from the Progressive Student Labor Movement had occupied Mass. Hall for three weeks to demand that Harvard pay its workers—including dining hall employees—salaries that matched the increasing cost of living in the Boston region. But the part-time producers say they were fortunate enough to be pulling $11 or $12 an hour already at Leverett, a significant improvement on their previous jobs. “The pay was good, definitely,” Tunes agrees. And Luny knew that success in Puerto Rico was far from guaranteed. Still, he missed his family. And more than anything else, Nelson’s offer felt like the chance of a lifetime. In the end, their dreams trumped the security of staying near Boston and working at Harvard. “I wanted to do music more than anything else,” Luny sums up. Almost as soon as they touched down in Puerto Rico, the pair began producing a cascade of wildly popular anthems for reggaeton’s biggest artists. In 2003, DJ Nelson’s Flow Music released “Mas Flow,” a successful showcase of Luny Tunes productions featuring a wide array of vocalists. As reggaeton has gone mainstream, Luny Tunes have become two of its most recognizable faces. Nominations for their productions flooded the urban categories of the 2005 Premio Lo Nuestro awards, in which fans’ votes recognize Latin music; in February, they traveled to Miami to receive top “Urban Album” honors for “Mas Flow 2,” another multifaceted collection. Johannessen is now the general manager of Dunster and Mather Houses’ dining halls. Sitting in her new office behind Dunster’s serving area one afternoon, she opens a Web browser and pulls up some photos of her former Leverett employees attending yet another round of awards. As lunch dies down the same day, Brathwaite leans on the grille at the Leverett dining hall, where he still works, to fill out some paperwork. 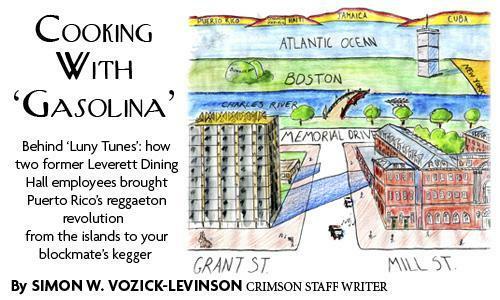 —Staff writer Simon W. Vozick-Levinson can be reached at vozick@fas.harvard.edu.